Toward the end of the school year when all the focus of conversations was, "What are your summer plans?" I was feeling kinda sorry for myself. Besides a quick road trip to visit with family, we don't really have any "plans". Or the funds to make any fantastic plans happen. I gulped a bit each time I told people we would be mostly staying home doing "whatever" while they went on about trips to the beach, Disney World, or NYC. 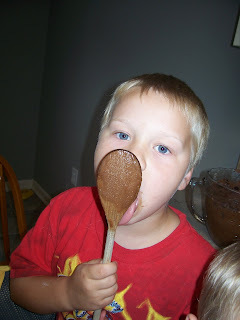 Truthfully, I felt bad that I was going to give my kids The Summer of Mediocrity instead of The Summer to Remember. 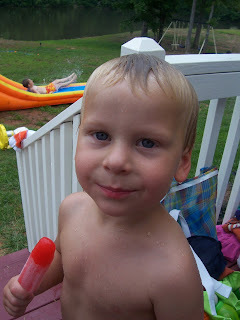 The kids and I went to a playgroup "water fun" at one family's house, complete with blow-up water slide and Popsicles. We attended a terrific puppet show at the local library and won a free book. The kids were excited to cross off chores on their very own Chore Lists. We ate fresh SC peaches and hot boiled peanuts with lunch one afternoon. We baked chocolate chocolate chip cookies. 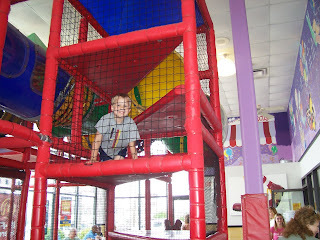 We met friends at McDonald's and The kids played on the PlayPlace after eating hot fudge sundaes. We ate pocket-fulls of candy while watching the movie at the movie theater's free movies. We swam at a friend's pool.